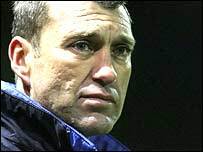 Peter Shirtliff's 15-month spell as manager of Mansfield Town has ended, reports BBC Radio Nottingham. The Stags have won just one of their last eight matches and have slipped to 18th in the table, four points above the relegation zone. Shirtliff told the club's website: "I'm disappointed but this is a results-based business and the results have not been good enough." Assistant boss Paul Holland has been placed in temporary charge. Shirtliff added: "I still believe that two results could have turned things around but that's the situation we find ourselves in. "I want to thank the supporters for the support they have shown and the players for their hard work and effort." Shirtliff took over from Carlton Palmer in September 2005 and turned around the team's fortunes by leading them to league survival last season. But the club have struggled in League Two this season. Chief executive Keith Haslam said: "Unfortunately things haven't worked out the way we both would have liked. "I hope Peter gets a very quick return to management and gets better luck in the future."